GT-1.JPGThe Mighty Ninth gets deployed to Vietnam; activity begins 12/65Photo taken on 8July66. 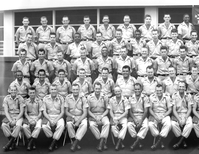 Men who were on alert to deploy to Vietnam; preparations began in December, 1965. 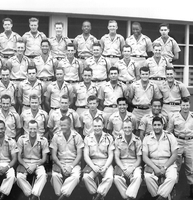 GT-2.JPGThe men who were set to deploy from HawaiiAt left is Thompson, Gary Cotter and Manuel "Joe" Guerrero. GT-3.JPGA little joy before deploymentFrom left: Julius Uler, Ray Churchill (KIA), Manuel "Joe" Guerrero, and Michael Huseth. GT-4.JPGMessage from Terry Russell, Battery ClerkTom gets a postcard from his friend Terry, who vividly describes the hectic pace of activity as the 2/9th FA prepares to deploy to Vietnam. The letter reads: "Hi Tom. Hope your Christmas is a bright and happy one. Guess what? We're headed for the big game very shortly. You should be here and see the work that's involved. I thought I'd break down many times. Everything at once. I doubt if we'll be here for New Years although A's to go ("A" Battery) to go the 5th. Got 15 new people one day and still coming. You've never heard such talk like now. If I don't come back, remember I died for your freedom. We all must agree we are scared, but some bravo's hate to admit it. We're working overtime even on the holidays. Well, Tom, I wish I could write more oftener, but you know how it is. Best of luck for '66. 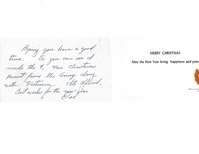 Card_from_Joe.jpgChristmas Card from friend Manuel "Joe" GuerreroManuel "Joe" Guerrero sent a Christmas card to let me know that he was "selected" and made it to Vietnam with the deployment of the 3rd Brigade of the 25th Inf Division. 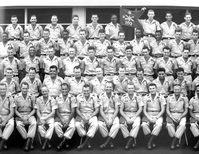 My service ended in September, 1965, but I stayed in touch with my buddies.